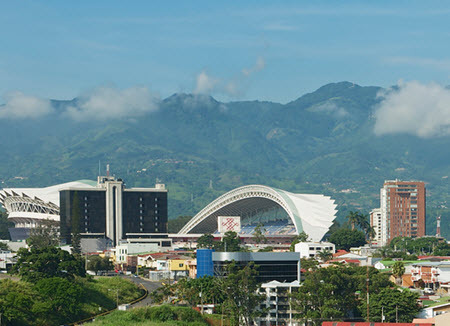 Costa Rica’s capital San José is located in the nation’s Central Valley. Ringed by lush green mountains, the city itself sits approximately 1,200 meters (3,700 ft) above sea level, making it considerably cooler and less balmy than Costa Rica’s famous beach towns. Roughly one third of Costa Rica’s 4.6 million population lives in the San José metropolitan area, but less than 290,000 of them live in the city proper. Before you start exploring San José, it’s good to know that the city is divided into 11 districts (distritos): Catedral, Carmen, Hatillo, Hospital, Uruca, Mata Redonda, Merced, Pavas, San Francisco de Dos Ríos, San Sebastián, and Zapote. This is a hilly animal park with an outdoorsy feel and a lot of greenery. Sometimes the sloths are taken out of their enclosures and placed in the trees close to the footpaths. Its Spanish name is Zoológico Simón Bolivar and it is located in Barrio Amón. Havana Humidor Room has one of the largest selections of genuine Cuban cigars in Central America. For Costa Rican cigars, The Costa Rica Cigar Store is a good choice. Costa Rica is famous for its top-notch coffee. Many touristy shops sell coffee, but the prices tend to be considerably lower in the supermarkets. In many cases, the selection of interesting Costa Rican coffee beans and ground coffee is also larger and more diverse in the big supermarkets. At night, the shopping center El Pueblo is transformed into a bar and clubbing district. Perfect if you want to go bar hopping, since a multitude of bars and nightclubs are squeezed into the alleyways in a very small area. Bochince is an art deco gay bar/disco. Diverse shows during the entire week. Fridays are especially popular, since there is a carnival at midnight. Mercado Central is an old food market in San José, filled with a myriad of small and mid-sized vendors of fruit, vegetables, fish, meat, and more. This market is also home to many small restaurants and street-food hawkers, giving you a chance to soak up the local flavours in an authentic environment. Museo de Oro Precolombino is located under Plaza de la Cultura and houses circa 1,600 pieces of pre-columbian gold work. The oldest pieces were crafted in 500 AD. At the exhibitions, you will learn more about the gold pieces in their social, cultural and religious contexts. Museo del Jade, found on Avenida Central (where it crosses Calle 13), has the largest collection of pre-columbian Jade in the Americas. Learn more about how these objects were made and why. The museum also includes pre-columbian objects made from bones, stones and shells. Museo Nacional contains, among other things, a collection of stone spheres from the Diquis Valley. This museum is not exclusively focused on pre-columbian Costa Rica. The two main airports in the San José metropolitan area are Juan Santamaría International Airport and the Tobías Bolaños International Airport. This is the largest airport in Costa Rica and also one of the busiest in Central America. It is located 20 km west of downtown San José, in the city of Alajuela. A majority of the flights here are international flights. Over 30 different airlines have flights to IATA:SJO. Located in the district of Pavas in San José, Tobías Bolaños International Airport is the main base for aviation within Costa Rica and to neighbouring countries. Quite a few private flight operations, charter flights and aviation schools also use this airport as their base. This airport is often informally referred to as the Pavas Airport. The most well-known airline at Tobías Bolaños International Airport is Nature Air, offering domestic flights between Pavas Airport and Liberia (LIR) and Tamarindo (TNO), respectively. Buses arrive in San José from Mexico, El Salvador, Guatemala, Honduras and Nicaragua in the north, as well as from Panama in the south. Examples of well-known bus companies that go to San José are Tica Bus, Transnica and Tracopa. There is no central bus station; the different bus companies each have their own separate bus stations. Some companies, such as Tica Bus, even have an hotel within their bus station. Trains were absent from Costa Rica for many years, but are now doing a small-scale comeback and can be a great way of seeing more of the metropolitan area and experience something out of the ordinary. Some of the carriages are very old wooden ones that reminds us of museum trains, but these trains are not tourist-traps – they are used by ordinary Costa Ricans for their daily commutes. From San José, trains leave for Heredia, Belen, Pavas and Curridabat. Heredia is a city located 10 km north of San José and home to one of the nation’s largest colleges. On weekdays, trains leave from Estación del Atlántico in San José (close to Parque Nacional). Some of these trains continue to the UCR and U Latina in San Pedro. Belén is the seventh canton in the province of Heredia, midway between San José and the Juan Santamaría International Airport. Trains for Belén leave from Estación del Pacifico in San José on weekdays. The third José trainline runs through the south of the city on weekdays. You can enter at Estación del Pacifico and let the train take you west into Pavas. Eventually, this train will turn around in the middle of the hills in a rather slummy area. For those going east, the train stops across the road from Estación del Atlantico and then proceeds to the UCR, U Latina och Curridabat. For more information, visit trenurbano.co.cr.